Product Description The automated Abel flash point tester is used primarily to test flammable and combustible materials for shipping and safety regulations. 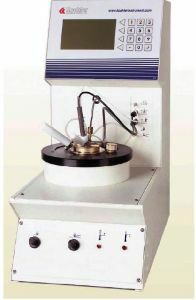 The flash tester provides an increased temperature range of operation as compared with other testers, allowing greater flexibility in testing samples according to the Abel test method. The unit provides a test range to 110°C and can be extended to -30°C by any appropriate external chiller. The flash point tests are simply conducted by mounting the flash cup filled with sample into the test position and selecting a pre- or user-programmed test method. Automation routines provide accurate test results. A quick search method is available to determine the flash point of unknown samples. The dual detection system (thermal and ionization) allows for testing of all types of products. Ignition by gas flame or electrical ignitor are included on both models, along with safety cut-off devices. The test results are automatically corrected to standard pressure (101.3 kPa). The system is equipped with a differential Pt-100 RTD probe designed to duplicate the response time of a mercury-in-glass thermometer and with multiple sensors that continually monitor instrument function, displaying an error message if a problem is detected. Installation by the manufacturer is required and costs extra.